I had a friend request some animal themed onesies, so I used a combination of retired and current stamp sets to match the animals in the nursery. With transfer paper and an iron, it is a quick little project. Well thanks to a computer problem, I have been offline. I still don't have my computer, and I can't get to my pictures. So just imagine all of these blank pages with pictures of my convention roommates site seeing in Salt Lake City the day we arrived. Fortunately my pictures are on an external hard drive so they are safe - I just can't get to them right now. 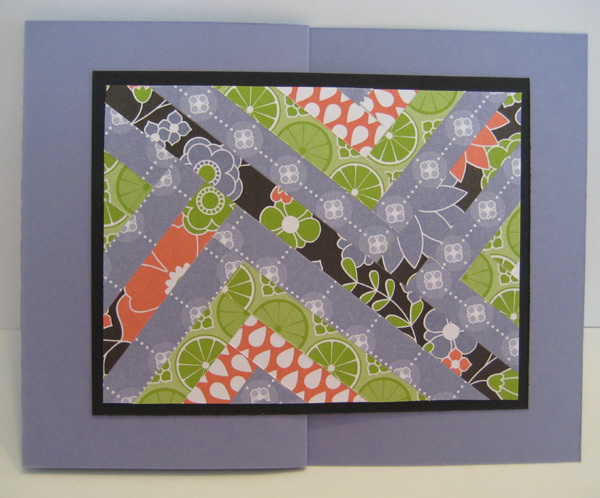 This layout was inspired by a Scrapbooks etc. layout that I saw on Pinterest. Thanks Michelle! 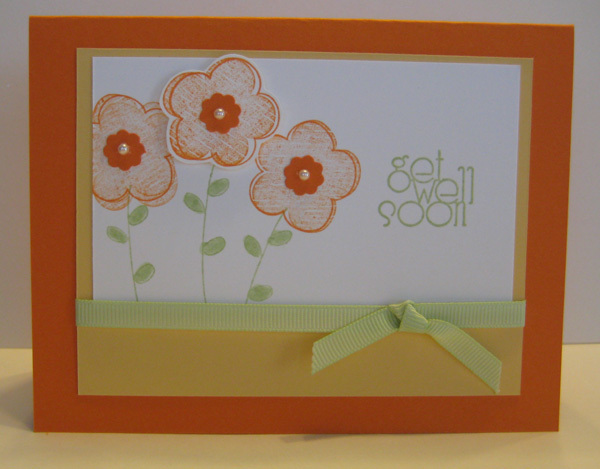 My good friend, Deana, just had a baby, so I had to pull out a retired stamp set to make a card. 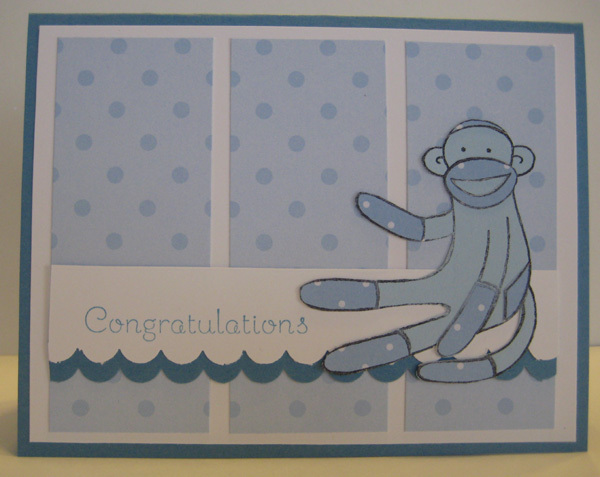 Deana has always loved this Sock Monkey, and it's become quite a joke in our stamping circle so it seems only fitting I use it for her card. I also pulled out some scraps of old blue DSP. 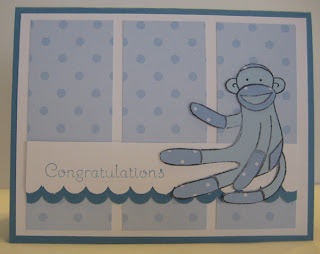 I stamped the monkey on Bashful Blue and on the DSP, and then I mounted the small cutout bits onto the whole piece of Bashful Blue. I also bought a cute little bib with sock monkeys all over it as part of her gift so the card was a must! Congratulations Deana and Jeremy! This was a quick card for our Stamp-a-Stack. I figured with the punch art bunny that we might need one that went a little faster. By stamping twice without reinking in between, we created a shadow look and then stamped a Chocolate Chip sentiment over Regal Rose. This stamp set was one I got free when I attended convention last summer. 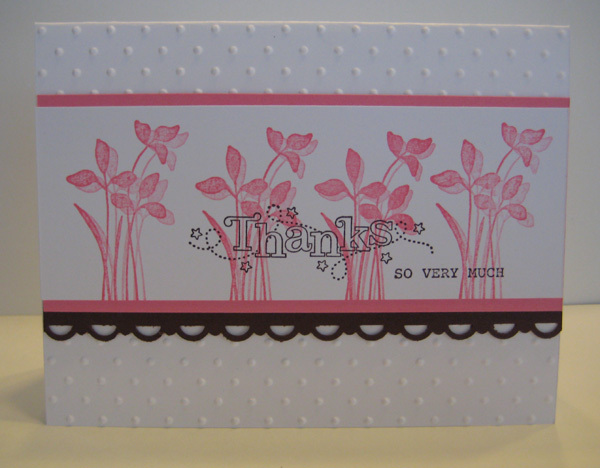 I am so glad I did because it makes wonderful cards, but I probably wouldn't have bought it myself. Sometimes you just have to see some great samples before you can see the potential for a stamp set, and Stampin' Up! does a great job with samples! 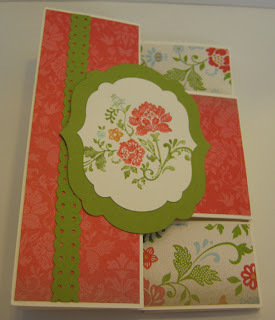 Here is one of our Stamp-a-Stack cards from earlier this month. It felt a little early to be making Easter cards, but it will be too late next month by the time we meet. So we are all ahead of the game with our Easter cards. This one takes a little time but it is worth it in the end. There's nothing hard about it -- it just takes some patience adhering all the little parts. 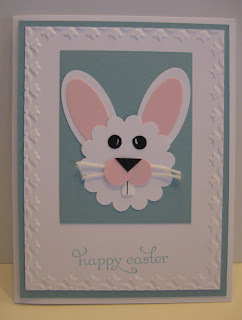 The nose and teeth were cut from scraps, and I used Pink Pirouette, Baja Breeze and Whisper White card stock. I have wanted to do one of these tri-shutter card for some time. I finally mustered up the courage to give it a try. 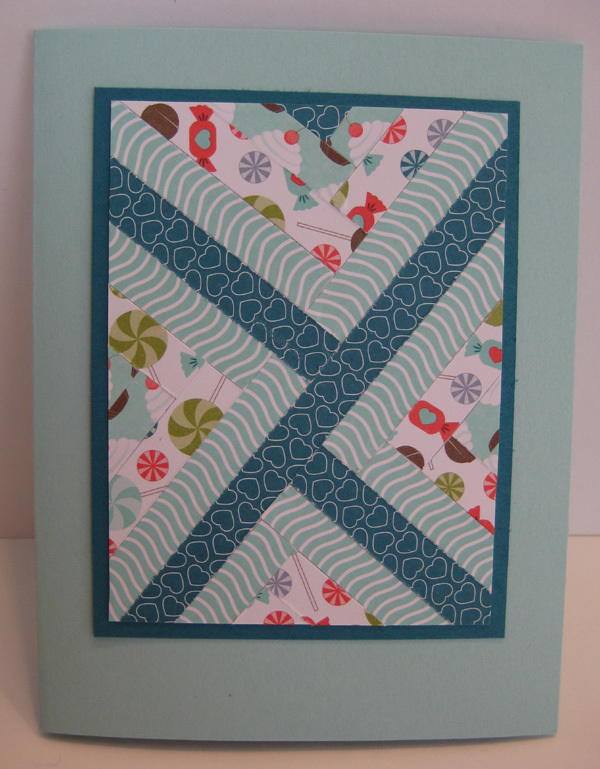 It takes a little time, but it's a pretty impressive card when you are done. 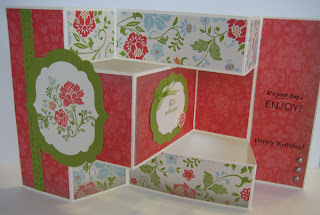 We did this in stamp club, and I put out the package of Everyday Enchantment paper and no two cards turned out alike. With the blue and green sides of the papers, it looks like an entirely different project. There is a tutorial at Splitcoast that I used, but I tweaked the measurement for the Designer Series Paper to suit the card I wanted to make. I first saw this idea on Pinterest, but when I followed the link, it took me to a blog that wasn't in English. 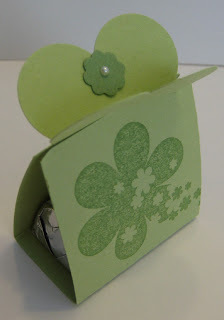 But she so cleverly figured out the five petal flower punch makes the cute little "heart shaped" top. 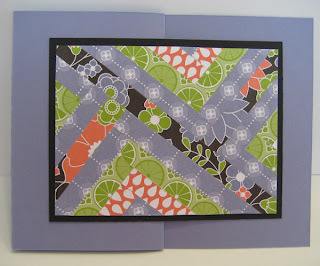 I cut my strip of cardstock to 6 inches and then scored 2 1/2 inches in from each side. 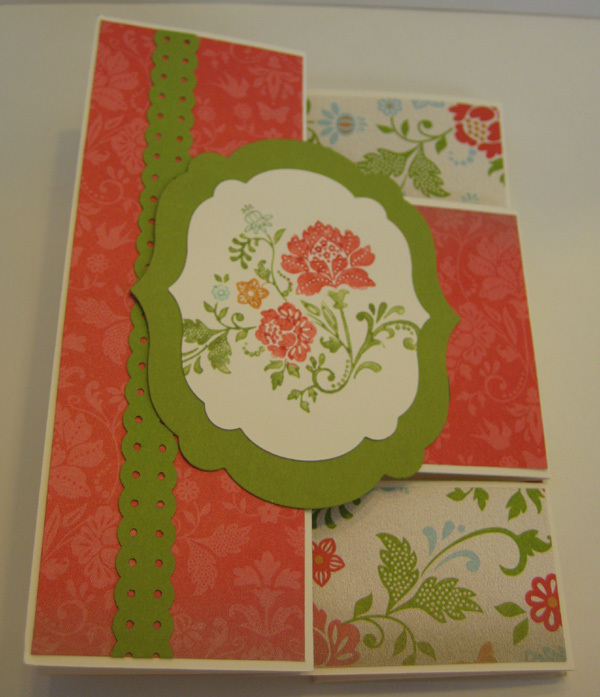 I poked just one end of the strip of cardstock into the punch so that only 2 of the petals punched. 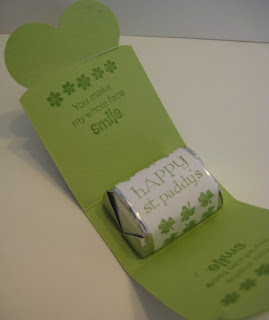 We then wrapped a Hershey nugget with a stamped mailing label and stuck it down with a glue dot. I didn't get to go to Stampin' Up's leadership convention, so thanks to the other great demonstrators willing to share their experiences. I attended a local demonstrator meeting and then viewed a long distance meeting via recording and saw two demonstrators highlight this convention demonstration - thanks Claudia and Mary Ellen. 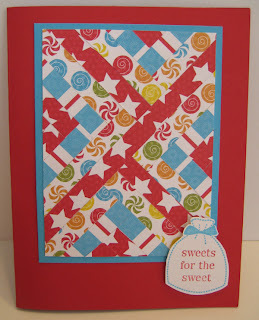 I made a few as I was trying to design one for stamp club. This red card was the winner, but I will stamp a greeting on the other two and put them to good use too. Use your Big Shot Multipurpose Adhesive Sheets to lay strips of Designer Series Paper out in the X and V patterns to create this herringbone design.